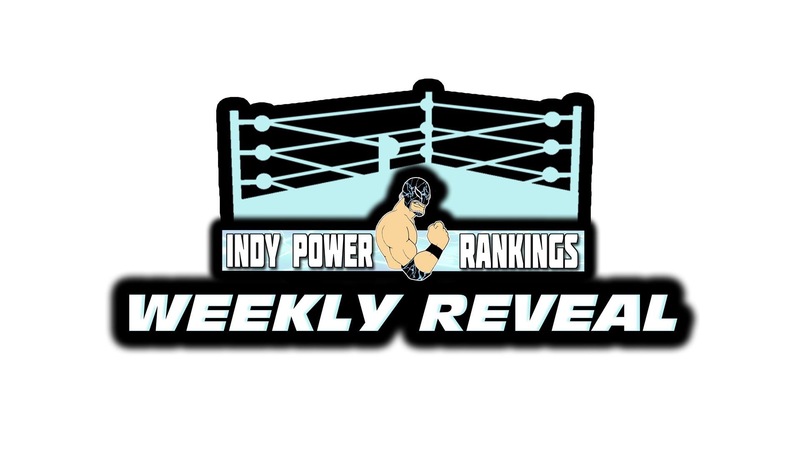 Who should be #1 in the Indy Power Rankings for the Week of 2/1/16? Who we are and how the final vote is tallied: http://wp.me/P4kQ6t-1&#x200b​Winner of the online voting competition is “People Champ” for the week AND helps their overall ranking! There is no award for second place but all votes that come in add to the wrestler’s final ranking so vote away! “The Assassin” Ray Kandrack def LaBron Kozone & James Ryan in a texas tornado handicap match to retain the CWF Mid-Atlantic tag title by himself. Prior to the match Coach Gemini who was in charge for the night fired Arik Royal along with other members of CWF forcing Kandrack to defend alone, which ended up being no problem. Coach Gemini came out prior to the RGL title match and said RGL champ Jesse Adler must go through a qualifying match before defending the title against his waterboy Chappy. The All-Stars Walter Eaton hit the ring attacking Adler. Thank you to all who tuned into Tuesday’s Indy Power Rankings Carolina Corner and donated or bought a ticket to tonight’s show in support of Angels for Andria! It looks as though the event was a rousing success and will provide some much needed assistance to Andria and her family as they move forward with treatment. 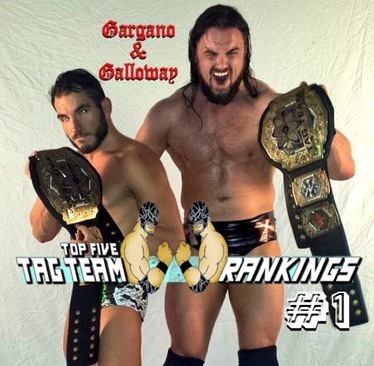 #1 Johnny Gargano & Drew Galloway-These two competitors have had a great deal of success in singles, which has been reflected many times with #1 rankings. That has yet to happen to either of them in tag team competition…until this week. Johnny Gargano and Drew Galloway seemed like a pairing that might do well together, but very few expected them to come out unscathed with a set of tag team titles around their waists. That’s exactly what they did as EVOLVE crowned Tag Team Champions over the weekend and Gargano & Galloway outlasted a tough crop of talent to win the gold. They defeated Catch Point (Drew Gulak & TJ Perkins) at EVOLVE on 1/22 in the first round, then defeated The Bravado Brothers (Harlem Bravado & Lancelot Bravado) on 1/23 in the semi-finals, and then defeated Heroes Eventually Die (Chris Hero & Tommy End) in the final on 1/24 to win the titles to go 3-0 for the week. Amazing week for two of the best in singles…who are now #1 for the first time as a tandem. They also picked up 16 fan votes to come in fifth in the online voting competition. 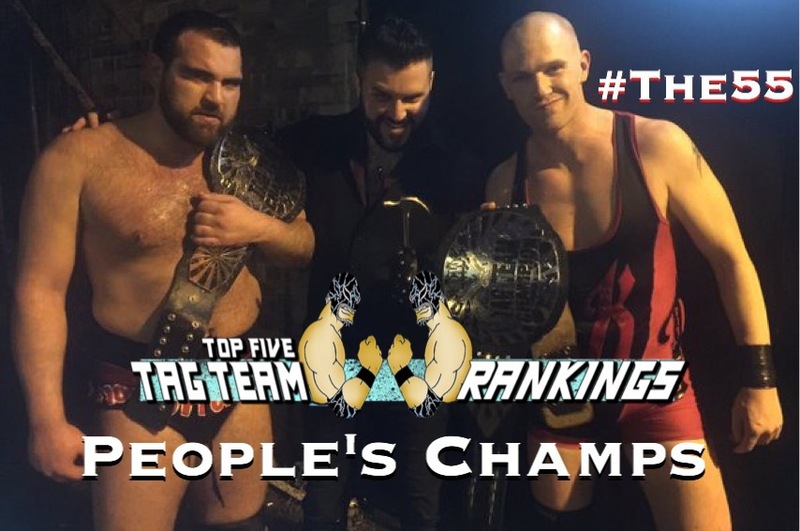 #2 Grits and Gravy (Bruce Grey & Jon Murray)-The Rockstar Pro Tag Team Champions have really taken their #34 ranking in the 2015 Tag Team Top 50 and built on it with some impressive victories in 2016. This past week they defeated 2 Bad Dudes (Juggernaut Jeremiah & Pompano Joe) on 1/20 to retain the titles and then defeated Dark Guns (Matt Taylor & Aaron Williams) at Ludus in a non-title match on 1/22 to go 2-0 for the week. 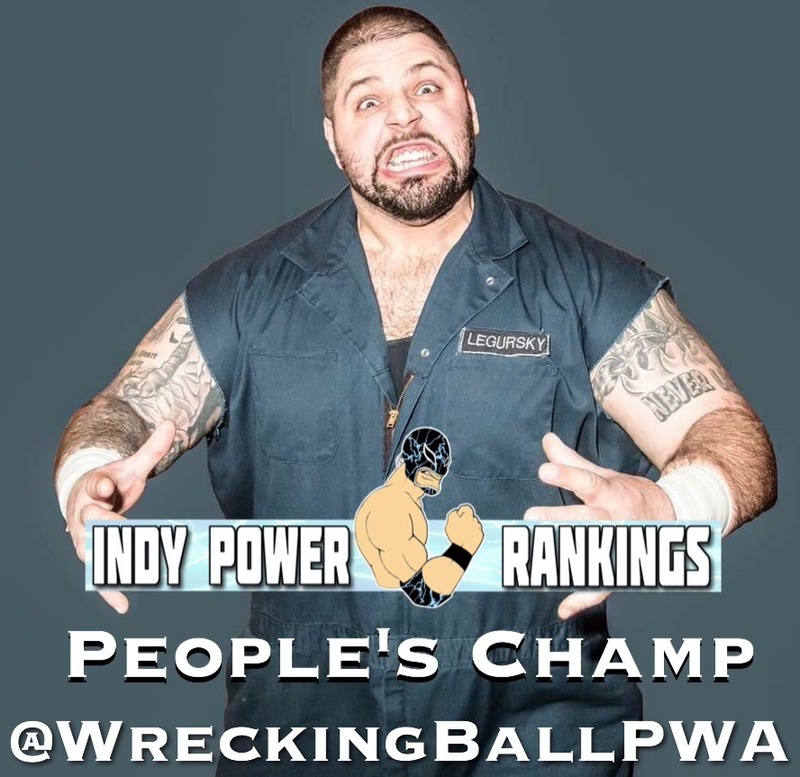 This was a particularly good week for Bruce Grey as he was ranked in both the Indy Power Rankings Top 10 and the Tag Team Top 5…which is something that not a lot of wrestlers have done. Congrats to G&G on another great week. #3 Monster Express (Akira Tozawa & Masato Yoshino)-After having 5 teams ranked in the 2015 Tag Team Top 50 from the Monster Express, the stable as a whole had been a bit quiet in 2016. This would be the second ranking for the stable this year and the first for this tandem. This was the money duo for the group in 2015 as they were #3 in the 2015 Tag Team Top 50 and now, they get the #3 ranking this week. They absolutely earned their first ranking together this year as 2/3rd’s of the Dragon Gate Open the Triangle Gate Champions teamed with T-Hawk to defeat VerserK (YAMATO, Shingo Takagi and Kotoka) at Dragon Gate on 1/19, then teamed with T-Hawk to defeat Over Generation (Gamma, Eita and Kaito Ishida) on 1/23, and then defeated Dia.HEARTS (Big R Shimizu and Kzy) on 1/24 to go 3-0 for the week. In terms of amount of wins, no one could touch them this week. #4 The Hooligans (Devin & Mason Cutter @BeardedBullys)-Blame the weather…blame a lot of things, but due to no fault of their own, The Hooligans actually drop three spots this week. Granted, it’s ALWAYS good to be ranked, but these Cutters love being higher than #4. That being said, it’s a great ranking considering they only recorded one win over the weekend, but it was a good one as they beat Roscoe Eat Lisa at PGP on 1/23 to retain the FIP World Tag Team Titles. Although it certainly felt like their year started off slow, it has picked up well for them as this is their third official ranking this year. They are the first and only team to do that so far in 2016. We expect more of the same as the year rolls on. #5 Tons of Pain (Joey Triton and Mann Dozer)-It was a tossup as to who might squeak into the #5 spot this week, but it ended up being Tons of Pain who had a very good weekend as they get their first official ranking as a team. They represented Australia well as they teamed with Marvin P Newton at Snakepit in Australia on 1/22 to defeat Damien Synn, Kory Kaiser and ‘Nightmare’ Eddie Draven and then defeated ‘Nightmare’ Eddie Draven and Dazel ‘The Kid’ Razel on 1/24 to go 2-0 for the week. There were a ton of other teams who absolutely had an argument for the #5 spot or higher but at the end of the day, this is how the rankings ended up on a very, very strange week of independent wrestling. People’s Champs. The 55 (Sha Samuels @Shasamuels & Kid Fite @Kid_Fite)-It was yet another solid weekend for the ICW Tag Team Champions as they defeated Polo Promotions (Jackie Polo & Mark Coffey) on 1/24 to retain the titles. That win got them on the poll and their fans came through in a big way as they collected a STAGGERING 412 votes to win this week’s online voting competition and their first People’s Champs Award. This is a team that holds some pretty prestigious tag team titles and if they can keep the momentum going, an official ranking isn’t far off. 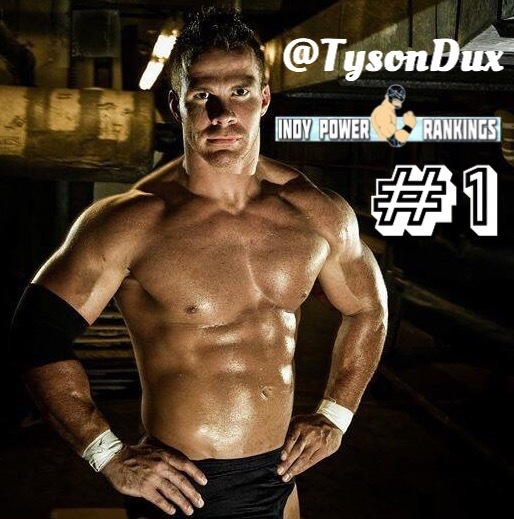 #1 Tyson Dux (@TysonDux)-Tyson Dux has been the quiet king of the indies over the last few years. He’s so good yet…so underutilized by so many people and companies. He’s currently ½ of the AIW Tag Team Champions but he achieved a BIG tournament win over the weekend when for the second year running the Ryan Buckley Memorial Tournament at Proving Ground Pro produced a #1 ranking. Last year Dux lost a hard-hitting match in the first round to Justice Jones, but this year…was his. He defeated Johnny Wisdom in the first round, then beat Craig Mitchell in the semi-finals, and then beat breakout star Jeff Cobb in the finals to go 3-0 for the week. The 2016 Ryan Buckley Memorial Winner is Tyson Dux…and quite honestly, no one deserved it more. We hope 2016 is the year that companies finally start to realize how great he really is. He also leaned on the fans a bit this week as he scored 37 fan votes to come in second place in the online voting competition which helped to propel him into the #1 spot in the official rankings. #2 Matt Riddle (@riddletuf7)-In 2015 Matt Riddle got some recognition from the official voters as he was on a roll at EVOLVE. That roll culminated over the weekend as he won the Style Battle 2016 Tournament. He beat Peter Kaasa at EVOLVE on 1/22, then beat Fred Yehi on 1/23, and then beat Tracy Williams in the finals on 1/24 to win the tournament with a 3-0 week. You can look up and down the Top 10 and while there were other great weeks, outside of Tyson Dux, Matt Riddle had the very best argument for #1 considering who he beat and the prestige of the tournament. Now with this high ranking under his belt, we expect him to build on that and have a FANTASTIC 2016. #3 Marty Scurll (@MartyScurll)-If we just look at ONE victory over the weekend, it would be hard to argue that any were bigger than Marty Scurll’s HUGE victory on 1/24. After beating Will Ospreay into unconsciousness, Marty Scurll became the NEW PROGRESS Champion in the UK. By all accounts, it was an incredible match and it was also a match that the official voters saw as very important in the grand scheme of independent wrestling. While he didn’t have as many wins as Dux or Riddle, what he accomplished was arguably even more important. After coming in at #61 in the 2015 IPR 100 (https://indypowerrankingsipr.wordpress.com/2015-ipr-100/) we expect him to top that ranking in the 2016 IPR 100. He also picked up 14 fan votes to come in 9th in the online voting competition. #4 Kenny Omega (@KennyOmegamanX)-We rarely see Kenny Omega in the Top 10 (because of his extensive work at New Japan) but this week was a special week for Omega on the indies. Kenny Omega gets his first official ranking since December 14th, 2015 as he became the NEW 4FW Junior Heavyweight Champion when he beat Mark Haskins on 1/23 to win the vacant title. 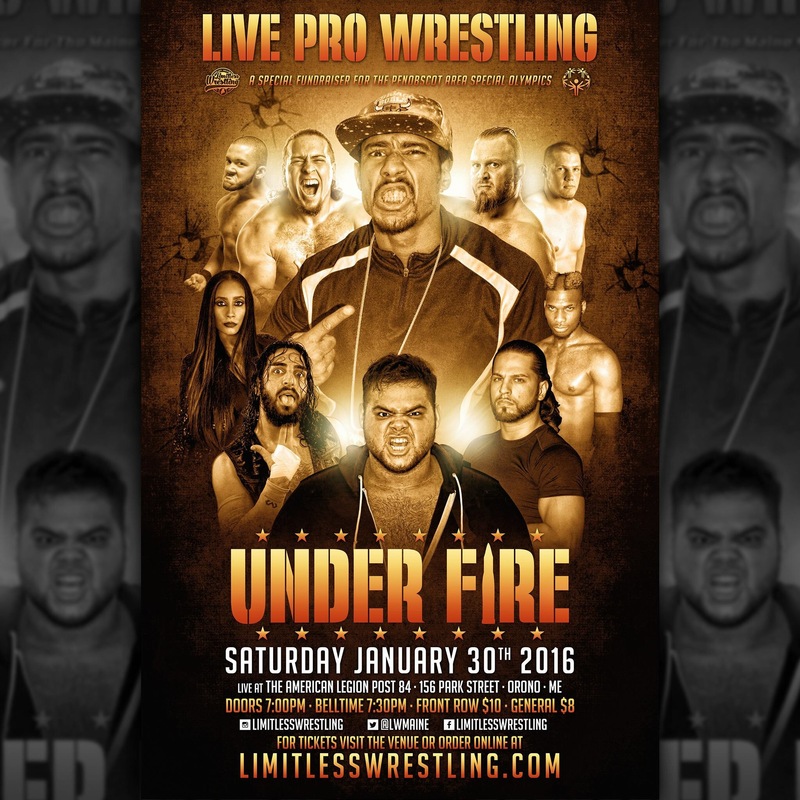 He then added to that impressive feat when he beat Ultimo Tiger at PWP on 1/24 to improve to 2-0 for the week. Omega is certainly one of the biggest stars on the indies and in New Japan…so now the question is how much time will he actually spend on the independent scene collecting rankings in 2016? We shall see. #5 Saime Sahin-Saime Sahin may not be a name that a lot of people who are reading this are familiar with just yet, but you can’t deny how impressive his weekend was in the UK. He is the NEW 4FW Heavyweight Champion as he beat Doug Williams at 4FW on 1/23 in a #1 Contender’s Match and then beat Tiger Ali the same night to win the title to go 2-0 for the week. On a week where there were a handful of 4-0, 3-0, and 2-0 records, Sahin separated himself from much of the pack with the title win combined with beating an established veteran like Doug Williams prior to that. We’re not sure if we’ll see Sahin back in the rankings in 2016, but this is one hell of a start. #6 Bruce Grey (@BombasticBG)-The Master of Memphis Strong Style” has historically been known in our rankings for his achievements in tag team wrestling, but this week he gets recognized for what he did in singles (with a mix of tags thrown in). 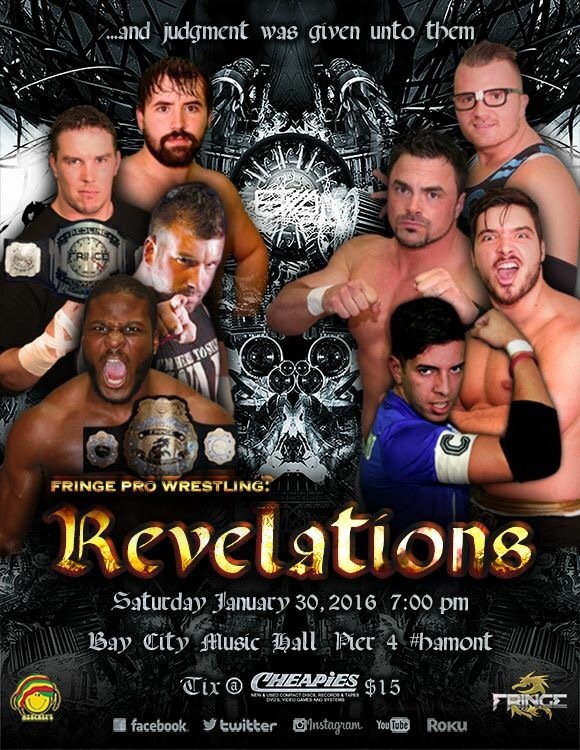 It was a 3-0 week for Bruce Grey as ½ of the Rockstar Pro Tag Team Champions teamed with Jon Murray on 1/20 to defeat 2 Bad Dudes to retain the titles, then teamed with Murray again at Ludas on 1/22 as they defeated Dark Guns (Matt Taylor & Aaron Williams) in a non-title match. He then switched to singles as he beat Ron Mathis at NOW on 1/23 to wrap up a perfect week. “Bombastic” Bruce is on fire right now whether it’s in tags or singles and we hope to see that continue as he’s one of the better talents in Ohio at the moment. #7 Jimmy Susumu-It’s hard to completely ignore a 4-0 week on a week where there’s only one competitor with a 4-0 record. Granted, only one of his wins was in singles, but 4-0 is impressive no matter how you look at it. He defeated Naoki Tanizaki at Dragon Gate on 1/18, then teamed with Genki Horiguchi H.A.Gee.Mee!!) on 1/19 to defeat Dia.HEARTS (Dragon Kid and Kzy) then teamed with Genki Horiguchi H.A.Gee.Mee!! and Ryo “Jimmy” Saito on 1/23 to defeat VerserK (Shingo Takagi, YAMATO and Mondai Ryu) and then teamed with Jimmy Kanda, Genki Horiguchi H.A.Gee.Mee!! and Ryo “Jimmy” Saito on 1/24 to defeat (Naruki Doi, Shingo Takagi, YAMATO and Mondai Ryu) to polish of a flawless week of wrestling at Dragon Gate. #8 Shotgun Stevens (@ShotgunStevens)-Shotgun Stevens gets his first official ranking this week as he beat Xavier Galaxy at BWW on 1/22 in a K5 Qualifying Match and then beat Dannie Deeds, Danny Knightmare, and Sugar Shane in a Ladder Match the same night to go 2-0 and claim the K5 Medallion. It should also be noted that he came in 7th in the online voting competition with 16 votes to ensure that he snuck into the Top 10 this week. Shotgun Stevens may be another one of those names you’re not familiar with, but with any luck and some hard work, it may not be the last time you see him in our rankings. 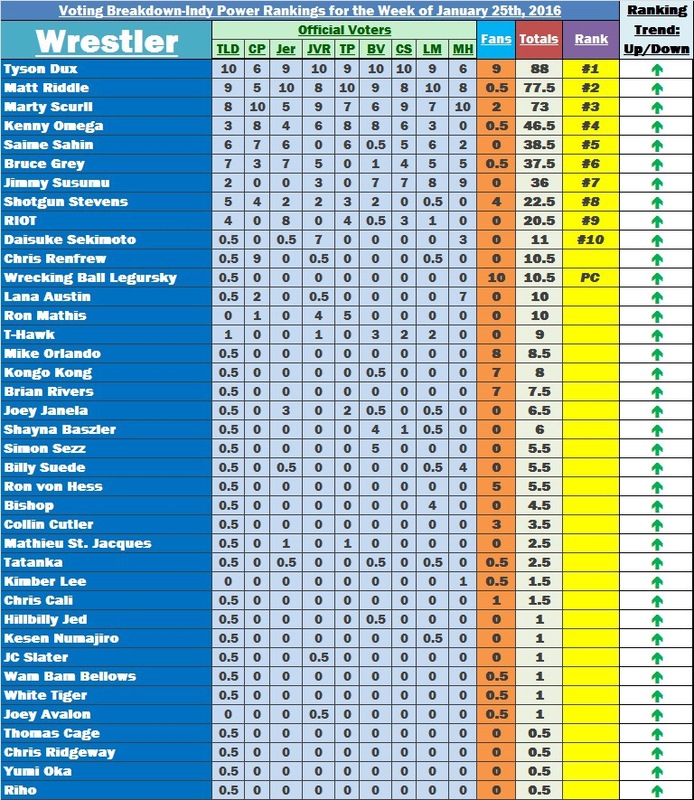 #9 RIOT-We have to give props to RIOT on his first official ranking as he is the NEW PWE Styles Champion. He beat Justin Zane at PWE on 1/23 and then beat Max Glory the same day to win the title with a 2-0 record for the week. This is undoubtedly a week of firsts as we have multiple competitors, like RIOT, who have not been ranked prior to this week. It was most certainly a very bizarre week with all the snow storms and blizzards shutting down shows, BUT that does open the door of opportunity for a lot of new names to get recognition this week. #10 Daisuke Sekimoto-Despite one loss, it was really hard to deny a wrestler of Sekimoto’s caliber from the Top 10 this week. The RJPW Legends Champion and 1/2 of NWA Intercontinental Tag Team Champions and Sakatako Intercontinental Tag Team Champions defeated Yuma Aoyagi at BJW on 1/18, then defeated Hiroshi Fukuda at Basara on 1/21, then teamed with Kohei Sato at Zero1 on 1/22 to defeat Masato Tanaka and Tosihiko Itakura to retain the NWA Intercontinental Tag Team titles, and then teamed with Atsushi Aoki at BJW on 1/24 to lose to Kazuki Hashimoto and Daichi Hashimoto to go 3-1 for the week. A 3-1 week may not be a perfect week, but it’s damn sure nothing to be ashamed of…and neither is a #10 ranking on a very odd week like this. 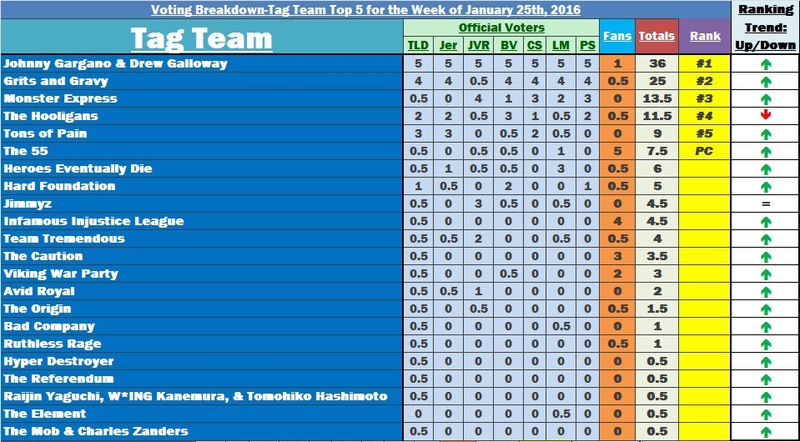 Who should be #1 in the Tag Team Top 5 for the Week of 1/25/16? Winner of the online voting competition will have their social media, merchandise, upcoming events, etc…promoted by us for a full week!